Lawrence Lessig presidential campaign: Donate before Labor Day for Citizen Equality Act. Why it makes sense to support a candidate who vows to straighten out democracy and then quit. 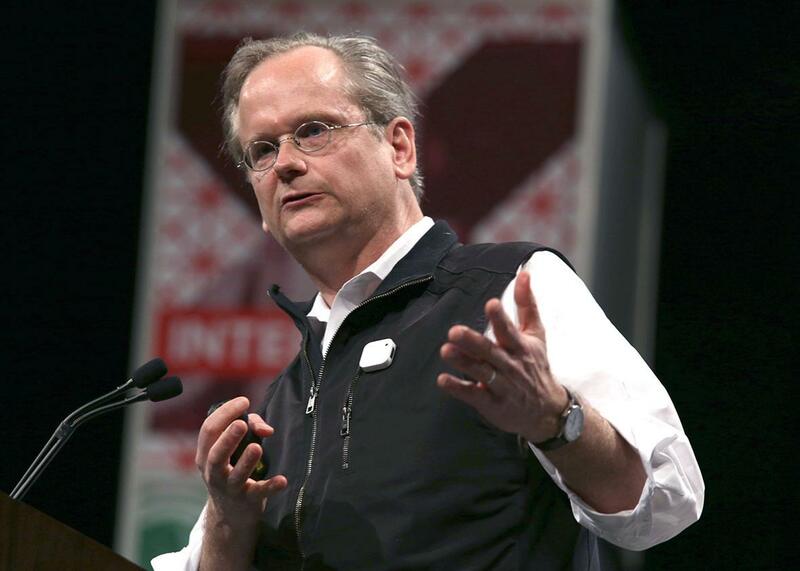 If elected president, Lawrence Lessig vows to quit as soon as possible. Here Lessig speaks at the South by Southwest Festival, March 14, 2015, in Austin, Texas. On Tuesday Lawrence Lessig, a Harvard law professor, announced that he would run for president if he receives $1 million in donations by Labor Day. Lessig’s plan is decidedly idiosyncratic—he has never held political office, and he declares that he will resign and hand over the orb of power to his vice president as soon as something called the Citizen Equality Act is signed into law. But Lessig, who is brilliant and influential (I know him slightly), has approached his presidential campaign with characteristic creativity. And if he can bring some serious worries about the corrupting effect of money in politics to public attention, his efforts deserve support or at least sympathy. For Lessig, as for Sen. Elizabeth Warren, the “system is rigged.” In his 2011 book Republic, Lost, he argues that money has corrupted politics. The problem is not bribery in the old-fashioned sense. Nor does Lessig believe that the problem is simply that interest groups obtain favorable legislation by making campaign contributions, bribery with a wink, as one might call it. Lessig believes that politicians and lobbyists are decent, law-abiding, and (even) ethical people who are caught up in a system of mutual dependence where money influences political outcomes without leaving any tracks. Understaffed and thinly spread members of Congress rely on lobbyists to inform them and even write the legislation, depending on the lobbyists more for their expertise, goodwill, and even friendship than for campaign cash. Lobbyists provide much-needed aid but always with a slant, reflecting their particular view of the world, which is not that of most Americans. The result is that, without anyone quite meaning it, law reflects moneyed interests while ordinary Americans are shut out. This has led to political polarization and loss of faith in democracy. Not everyone agrees with Lessig’s diagnosis. Political polarization and loss of faith in government long predate the modern era of money politics, as Ezra Klein has pointed out. It is also worth mentioning that Big Money has not blocked significant progressive legislative accomplishments of recent years—which have created quasi-universal health insurance, stricter financial regulation, and slightly more progressive taxes. But Lessig is certainly right that money in politics is a problem, and something should be done about it. Lessig says that his sole mission as president would be to persuade Congress to pass the Citizen Equality Act, which would implement three reforms to the political system. First, it would guarantee the “equal right to vote” by enhancing the power of the federal government to control how states conduct elections, requiring states to provide for online or automated voter registration, and shifting Election Day to a national holiday. Third, it would provide for “citizen-funded elections.” All voters would be given vouchers that they could use to contribute to political campaigns, and small contributions would be matched from public funds. Rules blocking government officials from becoming lobbyists would be strengthened. Would these reforms give us “citizen equality”? Unfortunately, if money goes to the root of the problem, as Lessig says, these reforms would have little impact. In the best case, they would enhance the popular vote in elections by a little bit. They might enhance by a small amount cash contributions from low-income people. And Republican-dominated state legislatures would lose some of their power to create safe seats. But in the economy of political influence that Lessig describes in his book, none of these things can make much difference. Most Americans are terribly uninformed about the political process and rely on very crude proxies (such as endorsements or partisan identification) to determine how to vote. Many people fail to vote not because of barriers to voting but because they’d rather spend their time doing something else. Candidates who suited voters a bit better because of ranked-choice voting (assuming it works as advertised) and who received more small donations from low-income people would still need to rely on well-informed lobbyists with whom they had relationships and would still benefit from massive infusions of cash from big business. Lessig’s cure just doesn’t follow from his diagnosis. The current disaffection with the government probably reflects the ideological polarization of the electorate, which is an input, not an output, of the political process. People disagree with one another more than in the past, so—whatever compromises the government reaches over policy—they are more likely to be unhappy with it. If people feel that they have no influence on political outcomes, that’s in part because we live in a huge and diverse country, and so even in an ideal system where your vote counts as much as anyone else’s, it’s just one of more than a hundred million. So there is a mismatch between Lessig’s means—a dramatic run for office as an unprecedented “referendum president” who resigns as soon as his mandate is legislated—and his goal, which is at best incremental reform. In the past, he has argued with a great deal more persuasiveness that the only way to reform the political system is through a constitutional convention, and it is easier to see the logic of this position than to understand his campaign goals. Constitutional amendments really could go to the root of the problem—by limiting campaign contributions (and thus overturning Citizens United, which held that the First Amendment banned certain limits on political expenditures), restructuring the Senate (which is a highly unrepresentative body that favors rural interests), limiting the power of the Supreme Court, and perhaps creating a parliamentary system or something like it, which would avoid the twin problems of gridlock and presidential abuse of power that have long been troubling features of our system of separation of powers. But most calls for constitutional conventions come these days from conservatives, who want to impose a balanced budget on the federal government and who have no interest in adopting Lessig’s electoral reforms—nearly all of which would benefit the Democratic party in the short term. And the results of a constitutional convention—where moneyed interests as well as all kinds of interest groups would play a big role—are unpredictable. Well, not entirely unpredictable. Under the amendment process of the Constitution, state legislatures can play an important role in selecting delegates and ratifying amendments. And while there is a means to circumvent their formal participation, they would probably influence the outcome. This matters. Republicans have vastly more control over state legislatures than Democrats do—in part because of the gerrymandering Lessig wants to end—so we can be pretty certain about the ideological tilt of any amendments that might ultimately be ratified, if not their content. This is probably why Lessig has not adopted his earlier proposal of a constitutional convention to his presidential run. The rot goes too deep. But it also should raise doubts about whether the Citizen Equality Act can do any good. Even if Lessig can’t win, or can’t do much more than hand over the reins to his vice president if he does win, his candidacy would bring a rare level of intelligence and political sophistication to the election and much-needed attention to the problem of electoral reform. For that reason, you might donate a little money to his campaign. I did.